Find the scheduled class which fits your time frame, HERE. Last Classes of This Kind in 2018. Find out how to use standard floor care equipment you have to pick up dollars you are walking over. Learn how to pick up small jobs and add income to your budget. By only adding a few drivers to you floor machine, you too can clean and polish concrete/terrazzo like the pros. Big companies can’t set up for less than a $5000. YOU CAN! Come to this one-off, concrete cleaning/grinding/densifying and polishing class, conducted by WCPFS Facility Services and Diambrush, and see how to put more $$$$ in your pocket… THAT NO ONE IS GETTING NOW!!! This ISSA/CMI Masters certification class is designed for frontline staff and middle management. Whether you are new to the industry or a veteran, these sessions are full of up to date techniques and technology. Be ready to change your mindset! Have you found yourself in charge of a department you know nothing about? Just moved into a position where the staff know more than you? Are you now inspecting work and have no idea as to the “how’s” and “why’s”? This class will explore everything you need to know about this flooring material, how it’s made, proper care and what NOT to do. Flooring materials are changing, are you changing your programs, tools and equipment to meet the demands of these new materials? Do you know how to tell what type of floor material you are maintaining? This 3 hour class will put you and your program ahead of others in how to deal with the issues, solutions and program when dealing with Luxury Vinyl flooring materials. This one day class will teach the essentials of stone floor care. Including, but not limited to, a brief geology lesson explaining how to identify different types of stones, such as igneous, metamorphic and sedimentary stones and the proper maintenance of each. During this hands-on class, you will learn to repair and remove stains from natural stone, Terrazzo and Travertine. Learn how to bring back the natural beauty by removing etching and stains, then polishing them back to the desired luster. This two day class will educate and train you on how to make money cleaning, restoring and installing a long-lasting, clear, protective coating on most tile & grout, terrazzo and concrete floor surfaces. This introductory session will give you basic information as to the ins and outs of electrostatic spraying units. There are choices to be made and you need to make the right ones, for the right reasons. This one hour FREE presentation is to introduce the partnership between the Academy of Cleaning Excellence (ACE) and EMist and upcoming VIRTUAL certification classes which have been verified by ISSA/CMI. Learn how to articulate the true value of your team. You are the leader of the Risk Management team. Now, deconstruct how you are currently getting there and find the best practice methods, chemicals, tools and equipment to get there. Register early for a $300 discount here. Jason Moore just graduated from the first ISSA Masters class of 2017 and has these insights to share. This class is now the ISSA/CMI Masters class and is held at the ACE Academy every month. No, certifications are not a requirement in the cleaning industry. Remember, you get what you pay for. Expect more! We suggest that each organization look at your standard operating procedures and find out if you are moving forward, or just keeping up with the pack. 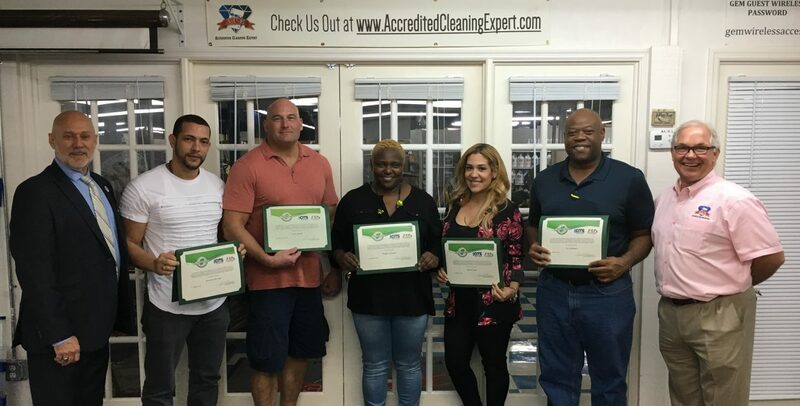 As the Director of Education here at the Academy of Cleaning Excellence, it is important for me to keep my certifications current and up to date. In order to instruct professional development classes around the globe, I maintain my ISSA/CMI Accredited Certification Trainer status every two years. Verified certificates from an organization, which is known in an industry, carries with it a value worthy of the workplace. Let this be evidence that I “walk the talk” so to speak. Our next CMI Master Certification class will be August 28th. Click here to see the full details on this industry leading certification.